Although navy and great northern beans are both white, they differ in size, shape, taste and traditional uses. Both types of beans belong to the common bean family Phaseolus vulgaris and are native to North and Central America. The beans were unknown in the Old World of Europe before colonists began arriving in the Americas around 1500. Great Northern beans got their name from what is now North Dakota, where the Mandan Tribe grew them for centuries. The Mandans also grew navy beans, which got their name after the U.S. Navy began to use the beans onboard ships beginning around 1850. 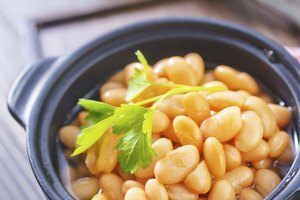 Great northern beans, which resemble white lima beans, are oval-shaped with a thin skin and larger overall than navy beans. Navy beans are also oval-shaped, but they are much smaller and slightly plumper than great Northerns, with thicker skins. 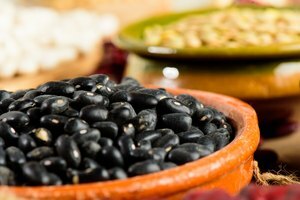 Great northerns and navy beans both possess subtle, mild flavors. 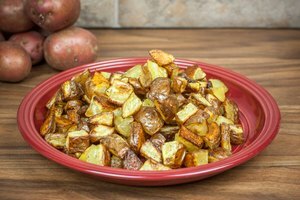 They're hard to distinguish from one another by taste alone, but they have a greater difference when it comes to texture. Great northerns are less dense, while navy beans have a smoother, denser texture. Because navy beans have a denser texture and thicker skins than great northerns, they take longer to cook. 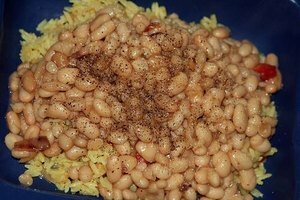 Cook great northerns for about 45 to 60 minutes and navy beans from 90 to 120 minutes. The slight variations in size and texture between great northern and navy beans has led to different classic recipes for each. Pasta e fagioli, an Italian classic soup with vegetables and lots of pasta.